Now, provided we do not digress too far from our subject, it is perhaps not inopportune to adduce Zacharias, who was slain between the temple and the altar, as a witness to the incorruption of the Mother of God. This Zacharias was a priest; and not only was he a priest, but he was also endowed with the gift of prophecy, his power of prophecy being declared expressly in the Book of the Gospel. 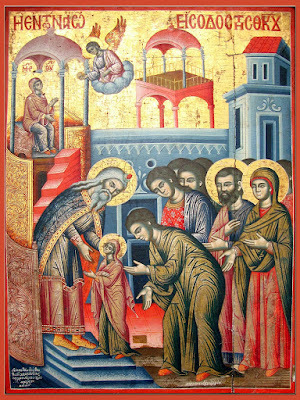 When the Grace of God was preparing the way for men not to think that birth from a Virgin is incredible, it set the stage for the assent of unbelievers by means of lesser miracles: a child was born of a barren woman advanced in years. This was a prelude to the miracle of the Virgin Birth. For, just as Elizabeth became a mother not by the power of nature—for she had grown old in barrenness—but the birth of her child is ascribed to the Will of God; so also, the incredibility of a virginal parturition gains credibility with reference to the Divine. As they were deliberating on these matters, they received advice from God that they should betroth her nominally to such a man as would be apt to guard her virginity. Joseph, the kind of man they were looking for, since he was of the same tribe and family as the Virgin, was found, and on the advice of the priests he was betrothed to the girl. Their affinity extended only as far as betrothal. Excerpt from Gregory of Nyssa's Homily on the Nativity of Christ.